Delta’s Four Winds Brewing is quickly making a name for itself around town as a major player in the local craft beer scene. Every new release is seemingly better than the last and I haven’t found a Four Winds beer that wasn’t outstanding. My latest beer dinner adventure took place at Sharkey’s in Ladner where Chef Brent Fahl put together a 4 course dinner, each course paired with one of Four Wind’s delightful beers. The first course was a punchy bold move by Chef Fahl. 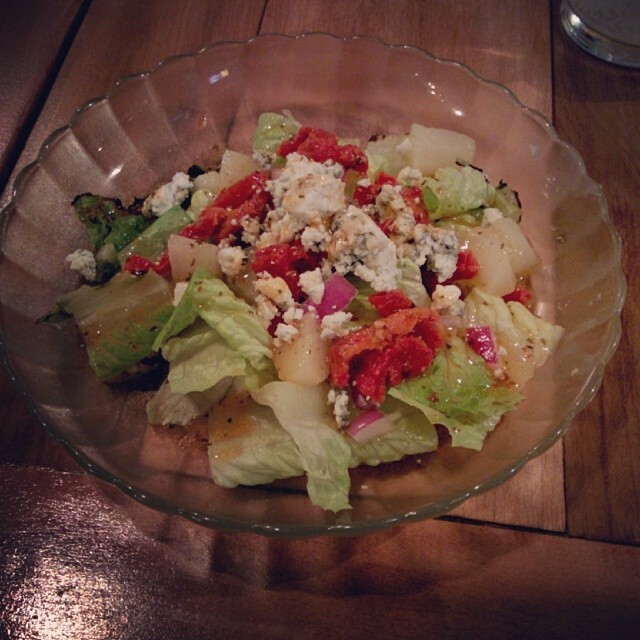 A Pear and Blue Cheese Salad, grilled romaine hearts, poached BC pears, lots of crumbled blue cheese, red onions, and a sundried tomato vinaigrette. If you’re not a blue cheese fan, but really why wouldn’t you be, this salad probably would’ve haunted your dreams for weeks. I, however, love blue cheese in all of its forms and this salad had the right punch and balance to make the copious amounts of cheese work. It was paired with Four Winds Wet Hopped ESB. This beer is incredible, the fresh hops are on full display here and the ESB’s malty nature gives them a counterpoint which a lot of “fresh hopped” beers seem to lack. The pairing worked very well too matching the strong flavours of the salad with heavy handed hops and malt, but not in a bad way. Course 2 was Chipotle Braised Pork Belly. 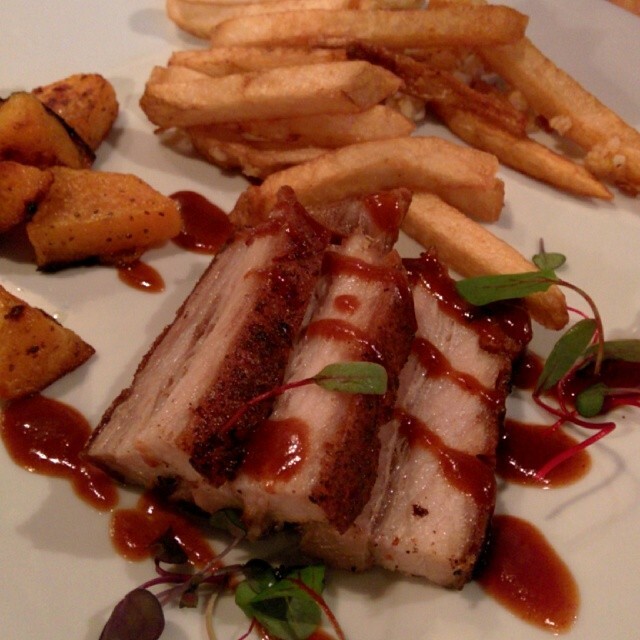 Beer brined oven braised pork belly, chipotle BBQ sauce, garlic beer fries and roasted butternut squash. The pork belly was tender and juicy with a great crust around the edge. The BBQ sauce was smoky with minimal heat. The fries were great, garlic and salt is something that is hard to mess up. The squash was also tasty but 2 starches was a heavy choice. This dish could’ve used something lighter like coleslaw or pickle slices. It was paired with Four Winds IPA. 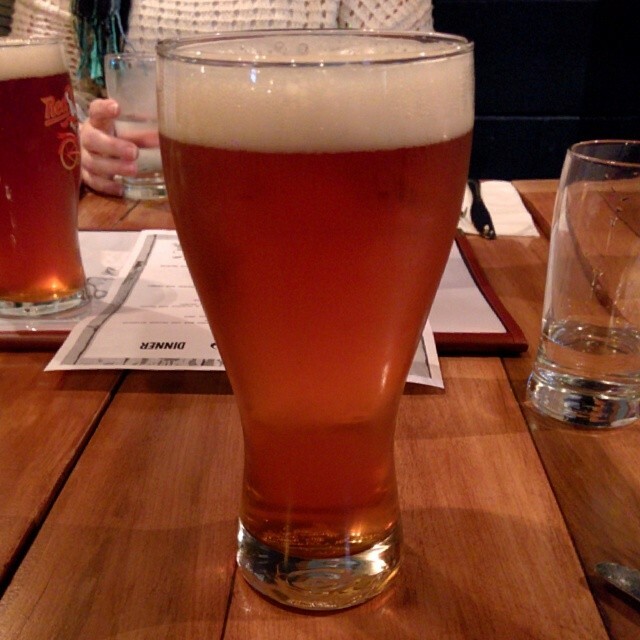 IPA’s are a perfect pairing for anything smoky or spicy and Four Winds makes a great IPA. The 3rd course was Crab Cakes. Crispy fried panko breading with a cucumber and wasabi sauce, basmati rice and fresh pea shoots. 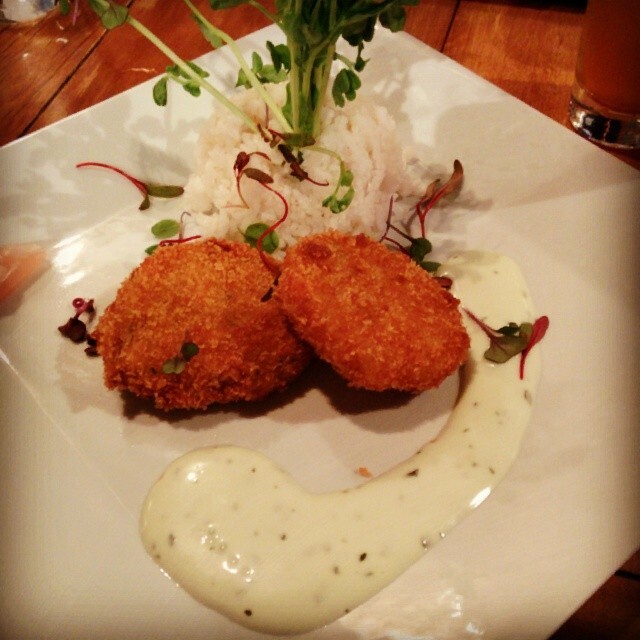 The crab cakes were a nice size and texture,. They had the right balance of savoury seasoning to accent the sweetness of the crab meat. The cucumber and wasabi sauce could’ve used a little more wasabi and the rice needed a little seasoning but the crab cakes themselves were very good. The Four Winds Saison paired well here. I wish it had been the recently released Saison Brett but the standard saison is equally as amazing. The 4th and final course was a rich Molasses Sponge Cake with vanilla ice cream and candied lemon zest. The cake was great, it had a gingerbread like taste from the molasses and it was super fresh and moist. The candied lemon zest was outstanding, I wish there was more! 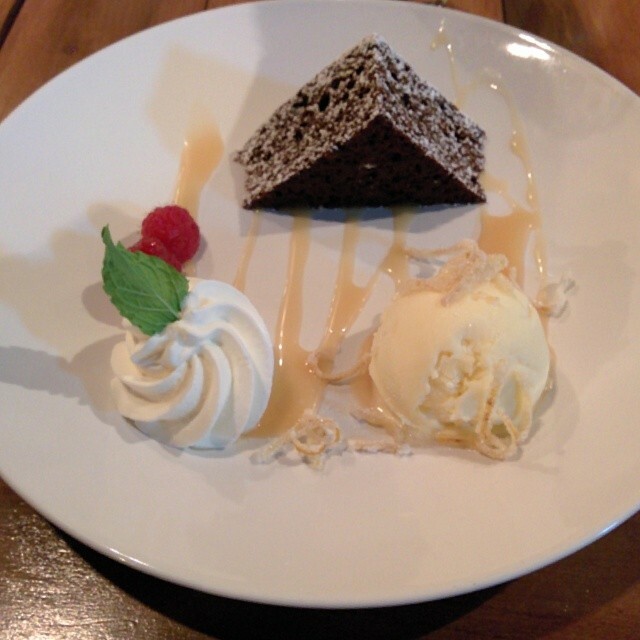 This rich dessert was paired with Four Winds Malted Oat Porter. This was my first time trying their porter and it’s fairly full bodied for a dark beer that tips the scales at 5.5% abv. The chocolate notes pair well with the molasses. 4 courses, 4 great pairings. Nicely done Sharkey’s! Follow Sahrkey’s on Twitter @sharkeyladner or on Facebook at Sharkeys-Seafood-Bar-Grille and Four Winds is @FourWindsBrewCo and FourWindsBrewingCo. Sharkey’s and Four Winds are both South Fraser Beer Club approved! The Scott Road corridor serves as the border between Surrey and North Delta. On almost every block you’ll find an Indian restaurant if not 2 or 3 all with amazing authentic dishes and great people but there’s something missing that would make them appeal to the masses. Tasty Indian Bistro, located at 8295 120th street (Scott Road) which is on the Delta side (damn, could’ve been a Surrey shoutout). offers décor that is stunning and very unexpected. As you approach the front entrance you can tell this isn’t your usual Indian joint, there’s a large well decorated patio and some very expensive looking polished stone under your feet. Once inside you’re greeted by a modern warm restaurant with dramatic lighting and high quality finishes throughout. Sadly I didn’t stay long because I had ordered take-out but I’ll be back soon to see if the presentation of the food lives up to the décor. I ordered some plain Jasmine rice, regular naan, garlic nann, some vegetarian samosas, butter chicken and lamb korma. Everything was top shelf, the samosas are just like the ones my high school friends used to bring for lunch back in my Surrey high school days. Both naans were fantastic, the garlic naan was mild enough that it didn’t overpower the bread as is the case in other Indian places. The butter chicken (somewhere Vikram Vij is reading this cursing butter chicken…) was tremendously good, so rich. with a subtle heat that seems to be left out of butter chicken these days. The lamb korma was orgasmic, the lamb was so perfect I cried a little and the sauce is so decadent, it’s a perfect combo. Also my wife “thinks” she doesn’t like lamb so I got to eat it all! If you like Indian food but want a more upscale dinning experience this is the place for you. The prices are very reasonable and comparable to other less swanky Indian restaurants. Go check them out!